I have been back in Powys recently, conducting a survey of the Public Rights of Way network that has had me reminiscing about doing this particular job over the years. 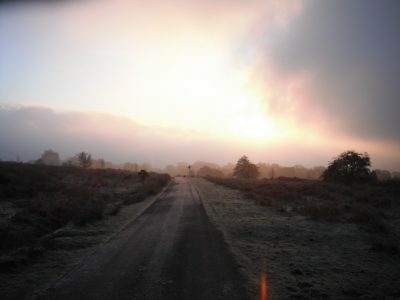 Since 2004, I have walked 5% of the paths in the county of Powys on half a dozen occasions. 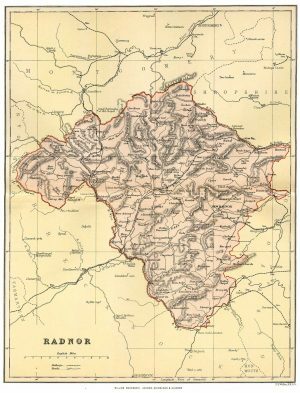 It has taken me to all corners of this extraordinarily elongated county; from Ystradgynlais, Pontcysyllte and the edge of the South Wales coalfields, to Lake Vyrnwy Llanrhaedr-ym-Mochnant and the Berwyns on the fringe of Snowdonia. It takes in most of the English-Welsh border country of the Marches, plenty of the Cambrian Mountains and even a tiny stretch of the Welsh coast around its former capital at Machynlleth. 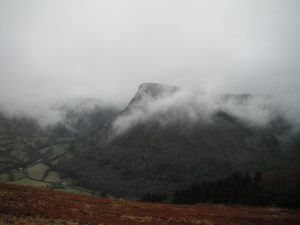 It is based on the ancient Kingdom of Powys and its name is derives from the Latin word pagus, meaning countryside. This is very appropriate as the county is a vast sprawl of hilly farmland, the archetypal vision of Wales’ lush green valleys. Its largest settlement is Newtown with just 13,000 people and most of it is grass, sheep and mud. This year I have been blessed. Until the final week of the survey, it barely rained a drop on me and there has been little of the icy roads that can make reaching far-flung paths impossible. Instead I have pottered around in my new van, visiting the sort of paths no-one has walked since I or someone else last surveyed them. It is common practice to park up in a lay-by and jump over the inevitable fence where there should be a path, before bounding over dozens more and eventually returning to the van. It is actually quite quick to proceed in this manner across the countryside and it led to me imagining the Powys Olympics, which took in barbed wire hurdles, gate vaulting and river long jumping. With the sun out, I have been able to appreciate for once the beauty of this landscape, all soft green hillsides and pleasing patchworks of hedges, lanes and fields. Yet it did not start so well for me. That first survey in the autumn of 2004 was the wettest three months I can remember and, possessing for the first time a VW camper van, I obstinately refused to entertain the possibility of staying in any other accommodation. 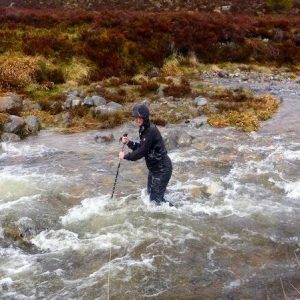 The result was my sinking slowly into a rain-fuelled despair, from which I share a few of my diary entries here. DDULUI, September 2004 – My first day on the job. 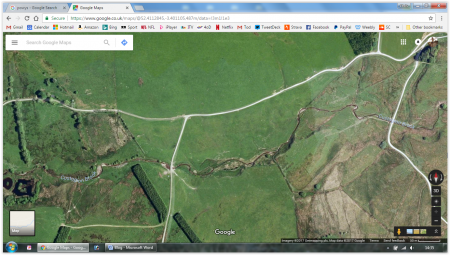 I drove up a valley beyond the road’s end above Llaeth-ddu until the track petered out and I left the van in a field of vaguely confused cows. By the time I returned, the sun was shining enough to beckon me into the Custogion Brook with the washing up. Unfortunately I then tried turning the van round in a heap of churned up mud and cow pat, and consequently slid about hopelessly wondering how I would summon help here. The farmer then appeared, driving sheep through the field, and seemed unconcerned by my presence. He commented only on the weather and whether I was planning to camp here. I somehow managed to get enough traction to escape, covering the van in poo as I went. He wasn’t hindering me, though, so I walked down to the river to find no bridge and a fair torrent pouring past. The farmer and his excitable dogs then watched in bewilderment as I took off my boots and socks, crossed the river with difficulty, pulled my boots back on, then dragged myself over two high barbed wire fences only with the aid of a tree, before bounding off across the field towards the next obstacle. 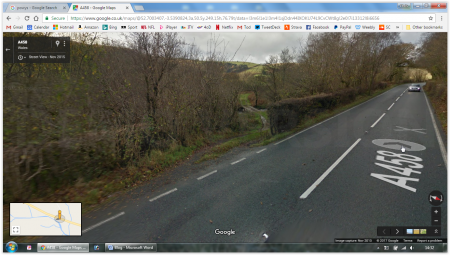 FOEL, October 2004 – So I’m driving the van along the A458 in the dark late on an October night, looking for somewhere to come to rest for the night. 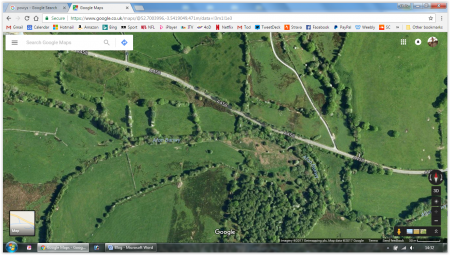 There is little option off the main road in the Banwy Valley, but I have spied on the map a couple of tracks leading down to the river beyond Foel and, having found a locked gate on one, I’m now trying the other. I suddenly spot it, a narrow gap in the otherwise constant wall of hedging. Though I notice quickly that it leads steeply downhill and has thick grass running down the middle of it, I don’t have to time to change my mind. I am already bumping uncomfortably down the track’s rough surface, the van scraping the vegetation on both sides. I try to slow, but braking has little effect as I slide down the muddy grooves in the dark. I finally manage to come to rest at the bottom of the slope just before the start of a bridge straight out of an Indiana Jones or James Bond film, all rotting planks and collapsing sides hanging over into the raging torrent of the Afon Banwy below. I get out to survey the scene by moonlight. There is no way I can reverse back up the muddy slope of what is now obviously little more than a bridleway, but the bridge seems to offer little hope. I walk across and, though rickety, I conclude by jumping up and down that there is a chance it may support the weight of a vehicle. I decide to take it fast with the probably misguided thinking that, if the bridge goes, momentum may carry me across. The bridge holds and I cruise onto a grassy track the other side, feeling my troubles are over. However, this track soon starts scraping the bottom of the van and I try to get off it to park or turn around, but find I am cosseted into its deep grooves. I continue to the first gateway, which leads into an open field full of sheep. Opening the gate, I imagine this a good opportunity to turn around and get out of here. I strangely decide to proceed with the lights off so as not to attract attention from the landowner, sensing that I will be able to see by the light of the moon. As soon as I am through the gateway, the sheep scatter and I start skidding around hopelessly in the field. Not forwards. Not backwards. Just spinning wheels. I start to envision the early morning encounter with an irate and frankly mystified Welsh farmer, from whom I will need to beg a tow out. Then miraculouly I find some grip going backwards and pick up a little momentum to reverse round, but I can’t see where I am going at all. When I put the lights back on, I find I am near the fence, but mercifully facing the right way. I wheel back towards the gate with the slight slope and bounce with relief onto the faint track again. I take the bridge of death even faster this time so as to have enough speed to get up the steep slope to the road. It is the only way and it seems this whole escapade has been mapped out by necessity ever since I mistakenly dived off the highway. I roar with relief as I hit solid tarmac and shoot straight out across the main road, one final moment of fate before the adrenaline can subside. I end the night in a gateway by the busy road, but I can barely sleep after this latest adventure. 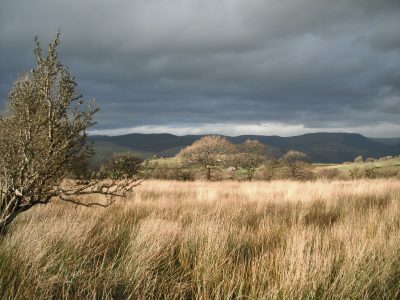 LLANDDEWI, November 2004 – Out in the Radnorshire wilds, those empty farming spaces between obvious hills or valleys that make this the most sparsely populated sub-county in England and Wales, days pass in a daze of water, mud and barbed wire. Only when I stop for lunch or am in the dry confines of the van do I manage to appreciate the colours in the air, the bronzed leaves hanging on the branches and lacing the lanes. It is a shame I cannot look up more, but I have tried and it is all I can do from losing my footing and indeed my temper. I don’t know what it is about these hills, which seem so gentle and appealing when seen from the warm confines of a vehicle, that they become the torment of man when he is loosed on their slopes for days on end. My tired daze has deepened over the last couple of days and I feel utterly disconnected from my surroundings. Today there were three uncrossable rivers and more barbed wire fences than I could count – every single walking garment I own now has barbed wire tears in it. I returned to the van early after trudging from point to point hollowly for some six hours and decided to head somewhere quiet for the night. On the first bend, there was a loud crash in the back of the van. This happened often enough, but this time it sounded worryingly wet. I looked round to see the pumpkin soup I had left on the cooker slopped across the bed and floor. Its thick orange gloop was splattered across the seats and woodwork and my only relief was that the bolognaise had not gone too. It was particularly galling as the soup was horrid anyway and I’d barely touched it after accidentally dumping too much pepper into it in the dark. I got out where I’d stopped abruptly in the middle of the lane and set about clearing up the mess, using a nearby metal feeding trough to rinse out my rag. The soup had soaked quickly into the carpet and bedding, so everything was left sodden, including my last haven from the incessant rain, my cosy and dry bed. A farmer approached from behind in a tractor, but I resolutely finished cleaning up, adamant that I could hold him up just as so many farmers had made me wait while chatting in the road over recent weeks. I finally drove on through Llanddewi, keeping the revs high to avoid the stricken van stalling. Yet on a particularly steep hill, the engine cut out as it had so many times recently. I had resorted to rolling backwards to effect a jump start, including on one particularly perilous occasion on the A40 through Bwlch. I tried it again here, but the narrow lane was not straight enough and I succeeded only in ploughing backwards into the hedge. Thinking I was stuck, I sang with manic laughter and pounded the wheel like the nutcase that Radnorshire had turned me into. 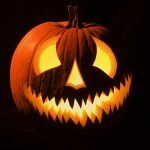 That night I rested in a quietly shivering quarry and transferred my maniacal face onto the pumpkin, which I left on a fence post, a lone orange glow in the Powys dark until the rain finally snuffed it out.